For the novel by Malcolm Rose, see Double Check (novel). From this position, 1.Bxe5++ is a winning double check. In chess, a double check is a check delivered by two pieces simultaneously. 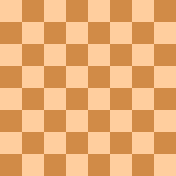 In chess notation, it is almost always represented the same way as a single check ("+"), but is sometimes symbolized by "++" (however, "++" is also sometimes used to denote checkmate). This article uses the latter convention for clarity. A position demonstrating how double check is possible without the moved piece giving check, by way of en passant capture by White. The most common form of double check involves one piece moving to deliver check and revealing a discovered check at the same time from a piece it had been blocking. (Such a check is an inherent part of the type of smothered mate known as Philidor's legacy.) The only possible replies to a double check are king moves, as both checking pieces cannot be captured or blocked at once. In some cases, the king can capture one checking piece and escape the other in a single move. In exceptional circumstances, it is possible for the moved piece to not participate in the double check (i.e. to give a "double discovered check", though this name is not actually used). The only way for this to happen in orthodox chess is by way of an en passant capture. In the position shown, Black has just played 1...g7–g5. White replies 2.hxg6e.p.++. The result is a double check even though the pawn White moved does not give check (one check is given by the rook, discovered by the capturing pawn's move; the other by the bishop, discovered by the captured pawn's removal). Such a double check is extremely rare in practical play, but is sometimes found in problems. Aron Nimzowitsch wrote, "Even the laziest king flees wildly in the face of a double check." Because the only possible response to a double check is a king move, the double check is often an important tactical motif. A famous example is Réti–Tartakower, Vienna 1910, which arose after 1.e4 c6 2.d4 d5 3.Nc3 dxe4 4.Nxe4 Nf6 5.Qd3 e5?! 6.dxe5 Qa5+ 7.Bd2 Qxe5 8.0-0-0! Nxe4?? 9.Qd8+!! (sacrificing a queen in order to set up a double check) Kxd8 10.Bg5++ and White mates after 10...Ke8 11.Rd8# or 10...Kc7 11.Bd8#. A double check was also seen in the celebrated Evergreen Game, Anderssen–Dufresne, 1852. Anderssen won with 20.Rxe7+! Nxe7 21.Qxd7+!! (a queen sacrifice to set up a deadly double check) Kxd7 22.Bf5++ Ke8 (or 22...Kc6 23.Bd7#) 23.Bd7+ Kf8 24.Bxe7#. With moas (shown as inverted knights) and grasshopper (shown as inverted queen). After Black moves his pawn to d5, taking it en passant results in quintuple check. With nightrider (shown as inverted knight). After Black moves his pawn to e5, taking it en passant results in triple check. In chess with variant rules or fairy pieces, other ways of delivering a double check may be possible. Triple, quadruple and even quintuple checks may also be possible. For example, in the position shown, after Black plays 1...d5, White plays 2.exd6e.p. quintuple check (the moa is a non-leaping knight which first takes a diagonal step, then an orthogonal one). After the en passant capture, five pieces check the black king: both moas, the rook, the grasshopper and the bishop. Triple check: Red moved his horse from e5 to d7, giving check and exposing a double check from the chariot and cannon. Quadruple check: Red moved his chariot from f9 to e9, uncovering two checks from the horses, giving a check of its own, and making a platform for the cannon at e7 to give yet another check.